Egypt's pharmaceuticals industry is facing a serious shortage of raw materials, as well as serious financial difficulties, as a result of the ongoing foreign currency crisis. Reliant on expensive imports for 90 percent of its components and restricted by government-imposed restrictions on retail prices, the industry is suffering, and the situation seems likely to continue as long as the currency crisis does. The prices of many listed drugs have not risen for more than 10 years, while production costs have soared, causing many firms to consider halting production. Meanwhile, consumers are facing an increasing scarcity of some medicines on the market. A Health Ministry source blamed the crisis on hesitation on the part of consecutive governments to increase drug retail prices. The source said that the 40 percent decline of the Egyptian pound against the US dollar is a key factor in the industry's growing crisis. Ahmed al-Ezaby, head of the medicine industry division at the Federation of Egyptian Industries (FEI), said there are about 200 medicines that are in short supply but for which alternatives are available. However, there are another 39 in short supply but without available alternatives, he said. Meanwhile, the Pharmacists Syndicate says that around 400 medicines are currently not available on the Egyptian market. Ezaby says that the retail prices of drugs and medicinal preparations should be increased to reflect the current dire situation. He also says Egypt must secure sufficient dollar reserves to allow manufacturers to import raw the materials essential to manufacture, and that this must be calculated separately from reserves intended for food imports. He put the domestic pharmaceutical industry’s annual dollar needs at nearly US$4 billion. The FEI has warned that a number of companies are on the point of halting production, as the importation problems and low retain prices bite harder. It added that companies have urged the government to consider raising retail prices before they take the step of halting manufacture. 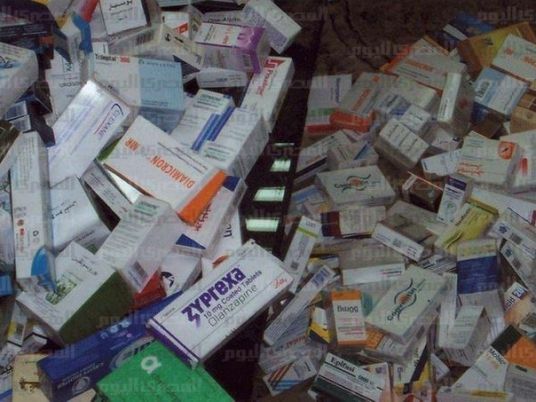 An official Health Ministry source said the ministry is already considering a proposal to “slightly” increase the prices of a large number of medicinal products, mainly those currently below LE10, as means of addressing shortages. The source added that the medicines market contains 13,000 brands, 40 percent of which are in need for a price increase to reflect production costs. Walaa Farouq, who heads the Health Ministry’s department tasked with addressing medicinal shortages, told Al-Masry Al-Youm that a decision by the ministry in February to increase the prices of 64 drugs had helped to reduce shortages in that month compared to the preceding months. According to Farouq, several factors contribute to drug shortages. A company could be running maintenance works in a way that causes reduced output, she explains. Others diminish their output due to the difference between production costs and sales revenue. A manufacturer could also have the production line halted by the ministry for violating manufacturing standards. She insists, however, that shortages have not affected the 99 sorts of medication considered “life-saving”, thanks to what she described as “strict measures” by the ministry to ensure their availability. She explains that the World Health Organization does not refer to shortages except when it comes to medicines with no alternatives that have a direct effect to patients’ lives. Sabry al-Taweel, head of the industry department at the Pharmacists' Syndicate, accused pharmaceutical firms of using the surge in the dollar price as a “pretext” for freezing some of their production. Taweel believes the crisis has other dimensions, represented in what he described as “an absence of a clear strategy at the medicine production division to address crises,” which, he said, caused a shortfall of 400 drugs. Ossama Rostom, deputy director of the FEI’s division, meanwhile, lays the blame on the price restrictions imposed by the health ministry. He says the ministry ignores manufacturers' calls to raise prices for fear of “public and media outrage”, adding that drug prices need to increase by 30 percent in order to cope with the surge in the price of dollars since 2011.